After an early morning departure from St. Thomas we’re safely anchored in St. John’s Cruz Bay by around 8:30am this morning. We take advantage of US cellular coverage for some morning phone calls and emails. Neither St. Thomas nor St. John’s has great cellular coverage, but even at 2G speeds, it is still much less expensive than using the ship’s WiFi or cell phone connections. After enjoying breakfast on the veranda, we head ashore in one of the waiting tenders. 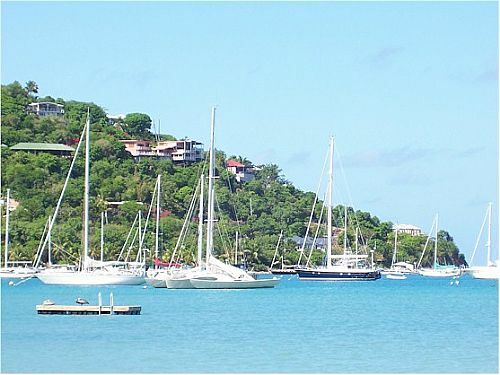 The waterfront in Cruz Bay is crowded with marinas, ferry piers and other commercial activities. The narrow streets lead to small shopping areas most with at least one casual restaurant or bar that overlook the water. It has a very “Key West” feel – friendly shop keepers and a laid back attitude. Many of the ships’ guests and crew are headed to secluded beaches and bays around the island. Perhaps one of the most famous of these it Trunk Bay. Famous for beautiful vistas, white sands and crystal clear water, Trunk is one of the favorite in the world. 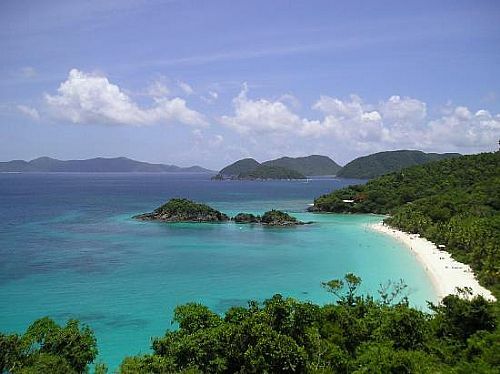 Also popular is hiking, biking and exploring within US Virgin Islands National Park which encompasses over 7000 acres on St. John. Back onboard we join our Azamara sales rep for dinner in the Discoveries Dining Room before heading to the “White Party” around the pool. It turns out to be a perfect evening for outdoor activities – a calm breeze and warm temperatures. Most of the deck furniture has been replaced with white linen tables used for dinner service from Windows Cafe (the buffet), and is now being moved aside to make space around the pool for dancing. This turns out to be a very popular party – everyone – guests, staff and officers seem to be enjoying themselves. Tonight while we’re sleeping the ship will make the short sail to Virgin Gorda, the third largest of the British Virgin Islands. Azamara Journey, St. John, US Virgin Islands. Bookmark.